To show appreciation to all HondaGrom.net members, here's a special discount code for your next order! Valid on our online store and for Grom parts only! Total in cart must add up to $100 in order for the code to be active. Last edited by steadygarage; 02-10-2015 at 06:58 PM. willsmysticcobra, i heart ricers and STR8GROMN like this. We still have this going for HGN members. This mean you! Might have to use this sooner than later! is out riding his Grom! Glad I saw this, getting ready to order a few things from your website soon. dangit! I missed this. 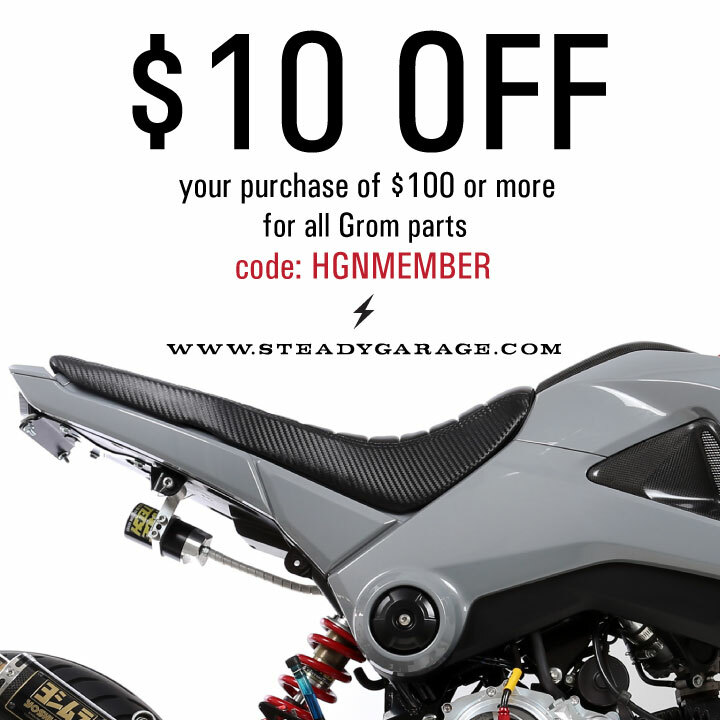 Not only did I not realize that Steady Garage is a Grom Sponsor, I missed this discount upon my recent YSS shock purchase ...... doh! is buying a lot of plastic parts! Really? Just used it a few weeks ago when I bought my lower fairing. New Memebers Dont Forget to Put Your Pin on the Members Map! !